BlueStar® All-Stars are passionate about achieving restaurant quality results at home. Alon Shaya is one of a group of professional chefs, which includes Marc Vetri and Michael Symon, who choose to customize their home kitchens with high-performance BlueStar equipment. We are very proud that this award-winning professional chose BlueStar for his home kitchen. 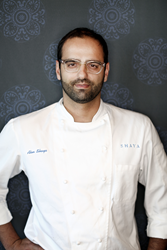 BlueStar® is excited to announce its All-Star Chef Alon Shaya has won a prestigious James Beard award in the 2016 Best New Restaurant category for Shaya in New Orleans. The award winners were announced at the James Beard Awards Gala at Lyric Opera of Chicago on May 2nd. The 2016 Restaurant and Chef Awards Committee – which includes 17 prestigious food and drink writers/experts for top publications and media outlets throughout the country – selected the winning chefs. BlueStar® All-Stars are a collection of chefs, critics and interior designers who are passionate about achieving restaurant quality results at home. This illustrious group of professional chefs, which includes Marc Vetri and Michael Symon, chooses to customize their home kitchens with high-performance gas ranges. Shaya selected BlueStar’s 48” Platinum Range in Infused Copper with infused Copper Knobs and a 52” liner to great restaurant quality results in his home kitchen. Handcrafted in Reading, Pa. since 1880, BlueStar® commercial-style cooking and refrigeration equipment is designed for discerning home chefs who demand restaurant-quality results in their own kitchens. BlueStar® also offers an unparalleled 750 colors and finishes, providing a new level of customization options for design professionals and clients. Home chefs can order the ranges with any configuration of burners and other cooking surfaces like built-in griddles, grills and French Tops. To customize a dream BlueStar® range, BlueStar® offers an online interactive “Build Your Own BlueStar” tool.